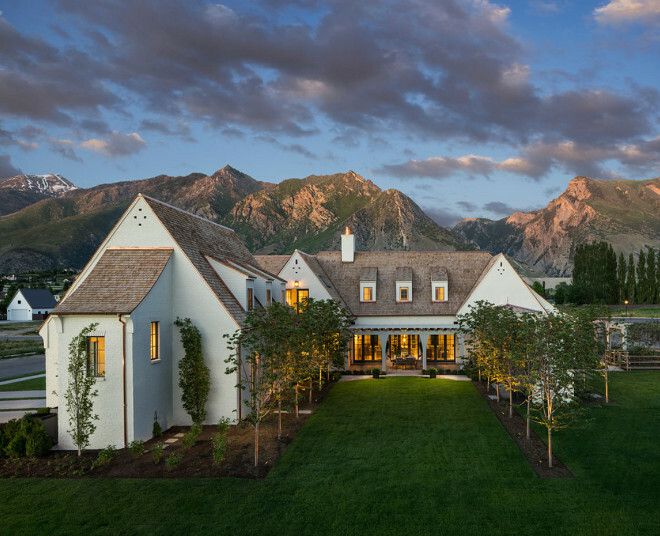 Utah Valley’s Parade of Homes 2016 was truly a huge success this year and how could it be any different with a gorgeous home like this on the list, right?! 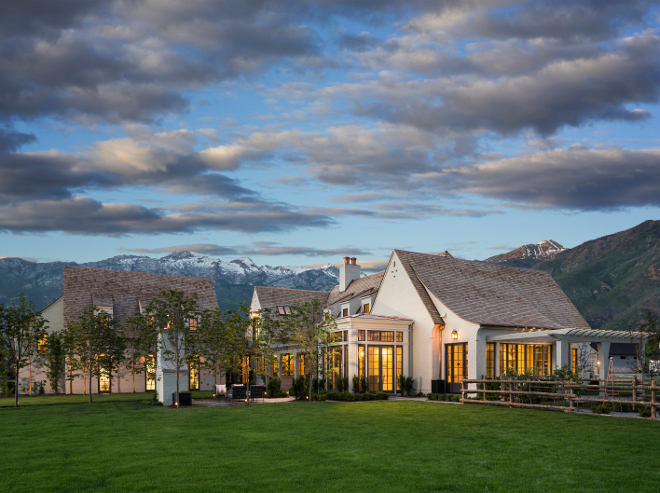 Nestled against the Rocky Mountains in Alpine, Utah, this modern family home with timeless interiors was designed by Elizabeth Kimberly from Elizabeth Kimberly Design and architect Bradford Houston from Establish Design. 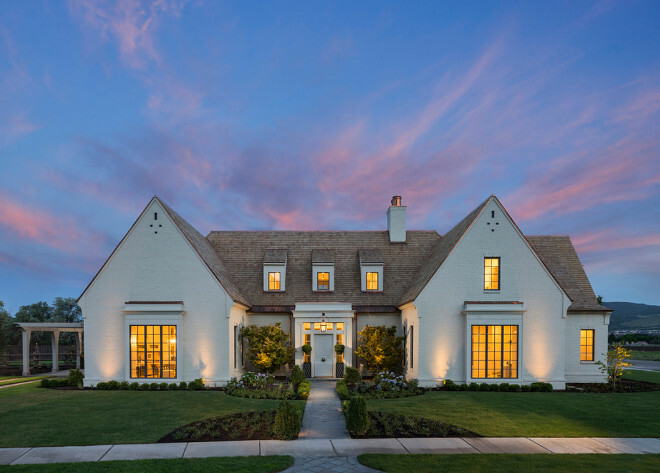 The home was meticulously built by Jackson & Leroy. 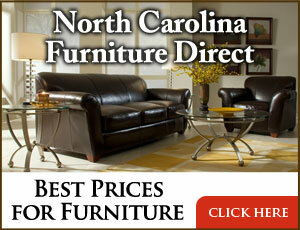 What you are about to see is truly the latest in interior design. Photos are by Joshua Caldwell. 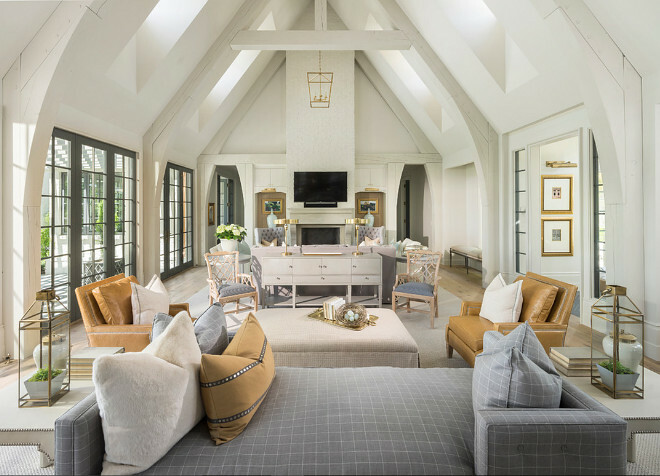 Charm and beauty is found in every space of this home. 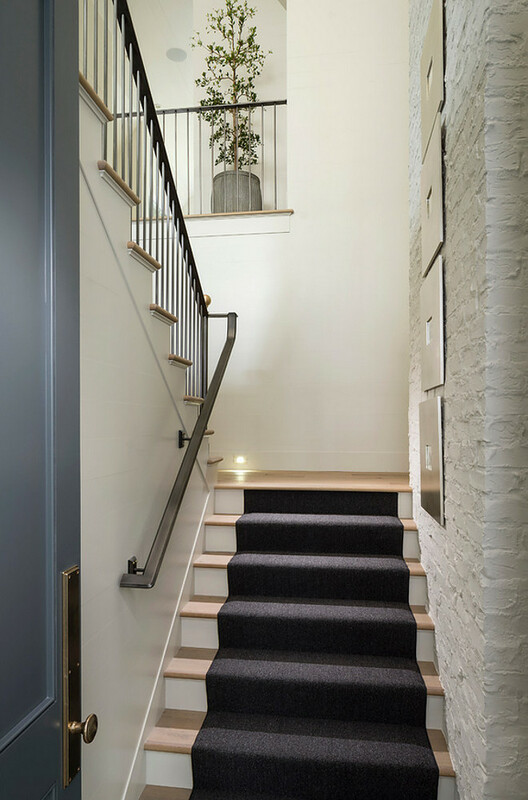 Notice the gorgeous slate floor tiles laid in a herringbone pattern in the foyer. The living room features timber ceilings and a brick fireplace. 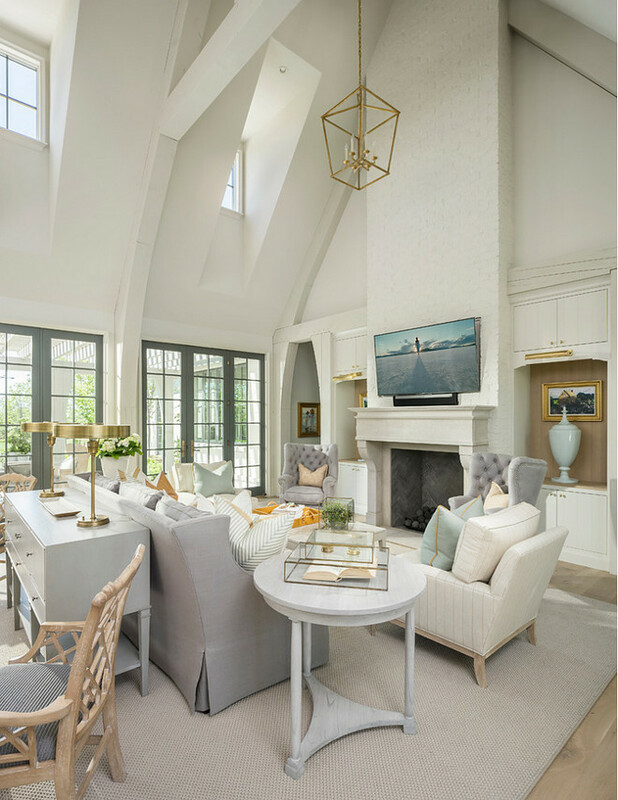 Brass accents can be found on the decor and lighting. Interesting mix of limestone with painted brick. 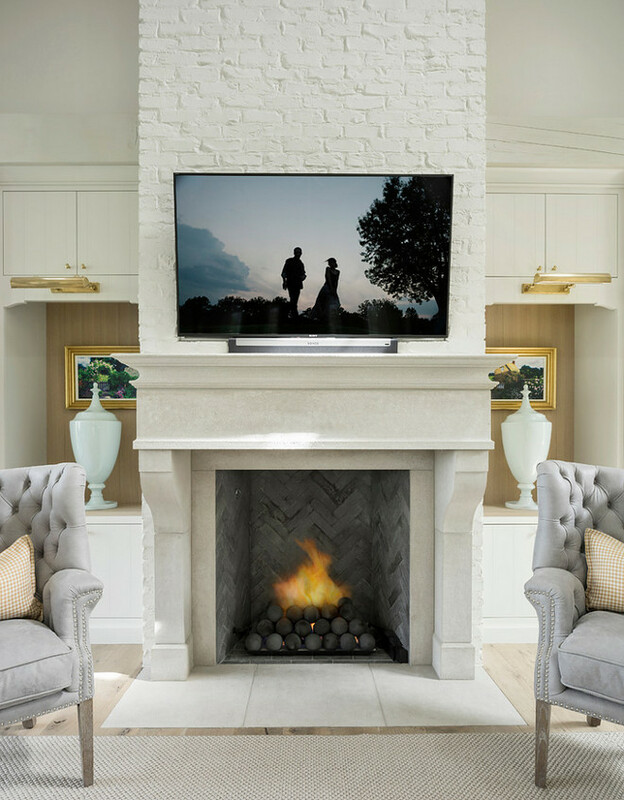 Notice the symmetry created by the cabinets on both sides of the fireplace. The living room opens to one of the most impressive kitchens I have seen! Isn’t this room magnificent? 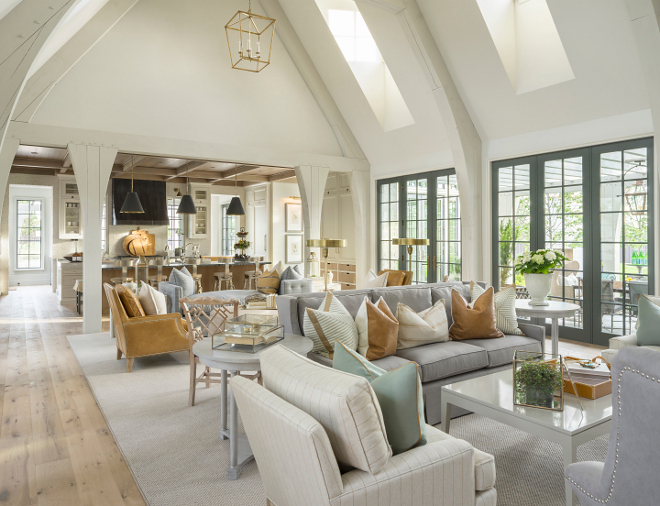 A long living room always feel more welcoming if divided in a couple of distinctive sitting areas. Sophistication is brought to this room through layered colors. 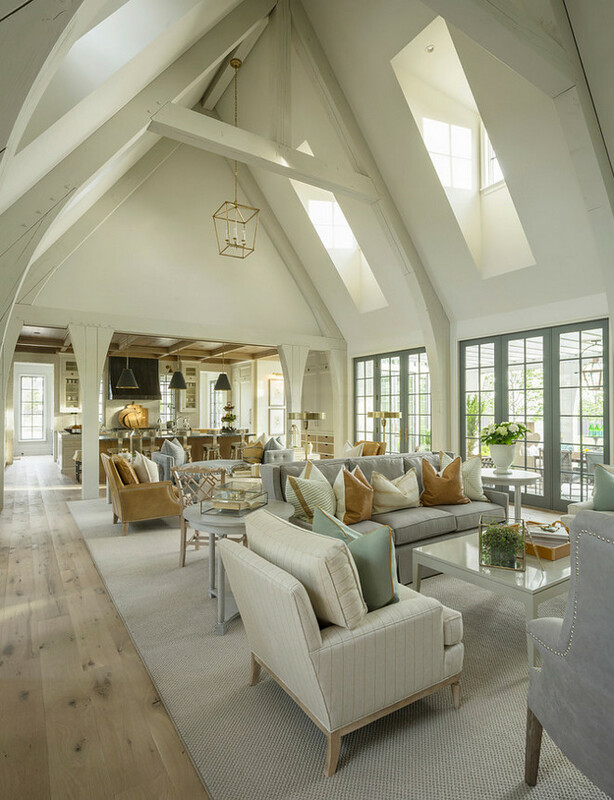 The open floor plan, the windows, and cathedral ceilings found in this living room are truly amazing. The decor is a perfect blend of old-world and farmhouse. 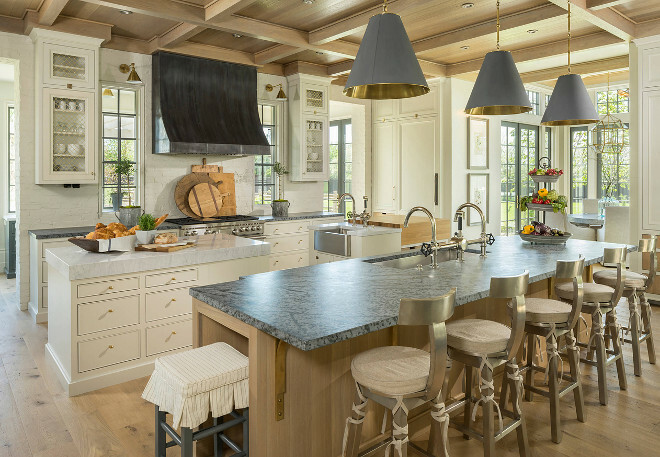 This kitchen feels fresh and innovative. It features not only one, but three islands! I love every detail found in this space. The kitchen once again carries that warming old-world feel that we saw in the living room. 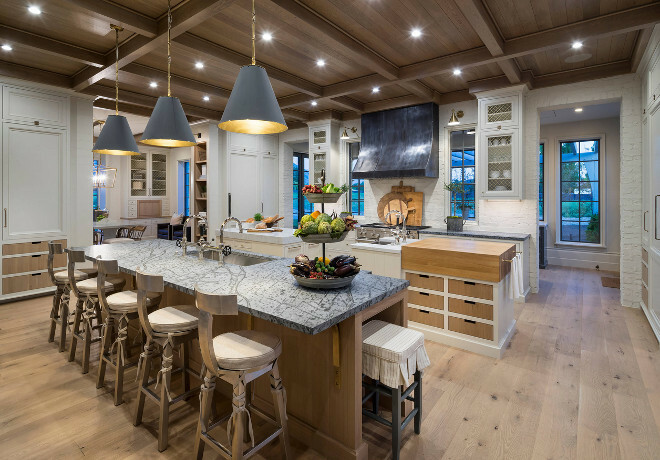 Notice the rustic barstools with cushions and the cone pendant lighting. 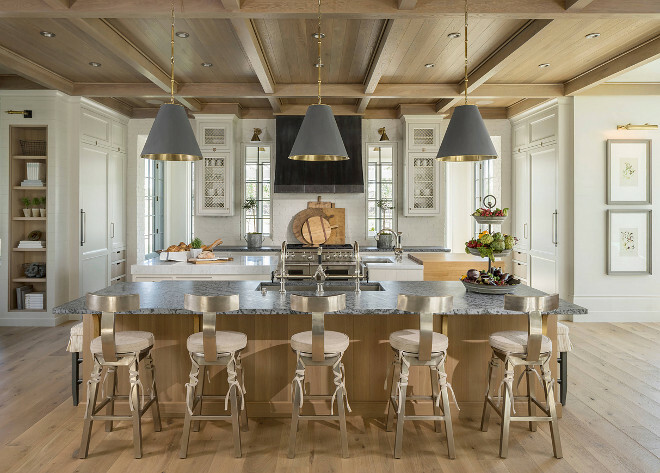 This kitchen is truly breathtaking! 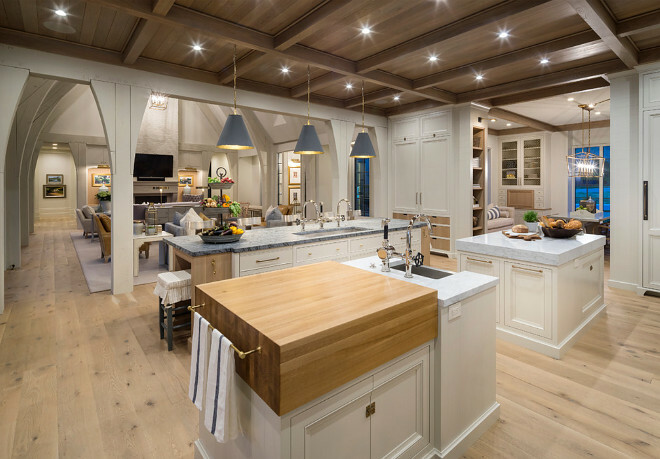 I love the two prep islands, the white oak plank floors and the coffered ceiling. 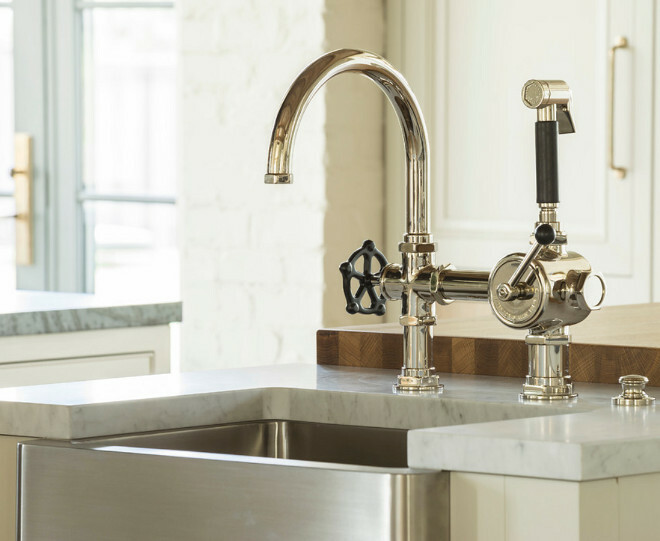 One of the kitchen islands feature a vintage industrial-style kitchen faucet with stainless steel farmhouse sink. 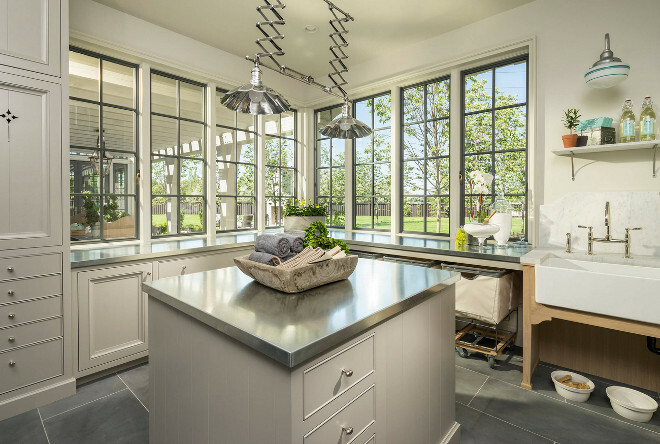 Can you picture yourself cooking in this kitchen? Notice the practical layout. 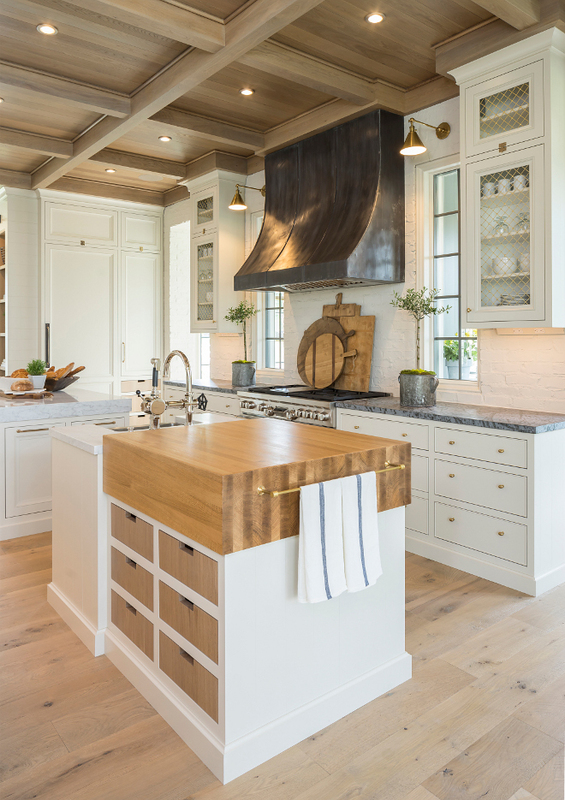 Millwork brings warmth and a timeless feel to this kitchen. This dining space feels cozy and inviting. 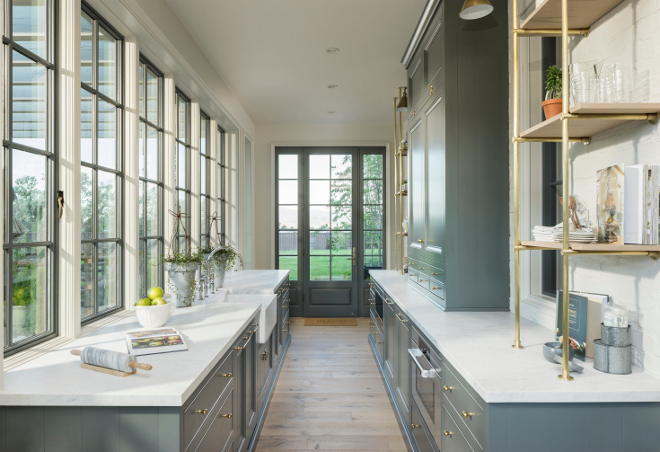 I love the floor-to-ceiling steel-framed windows and the brass lighting. Patio doors open to an outdoor sitting area with fireplace. This spacious butler’s pantry is located off the kitchen and opens to a fenced-in vegetable garden. 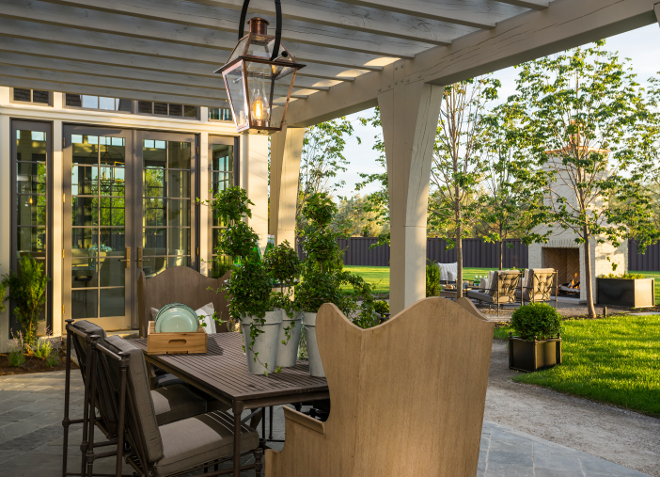 This welcoming patio is located off the dining area. I love the Bevolo lantern and the view to the fireplace. 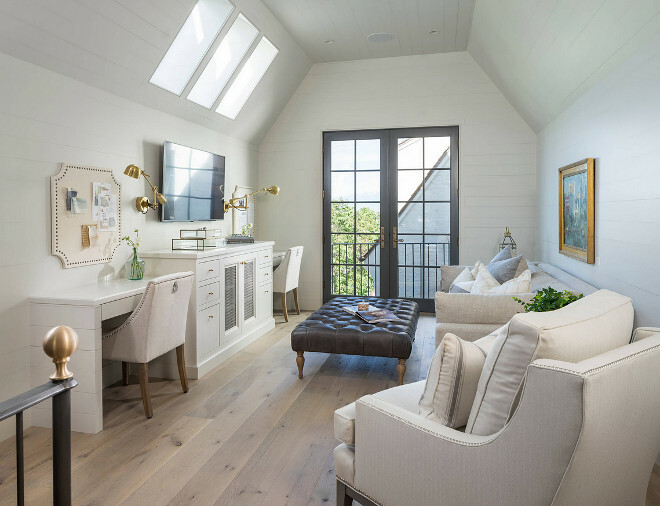 I can’t get over how gorgeous and functional this room is! At first, I thought it was the dining room, but it is in fact, the study! Isn’t it incredible?! 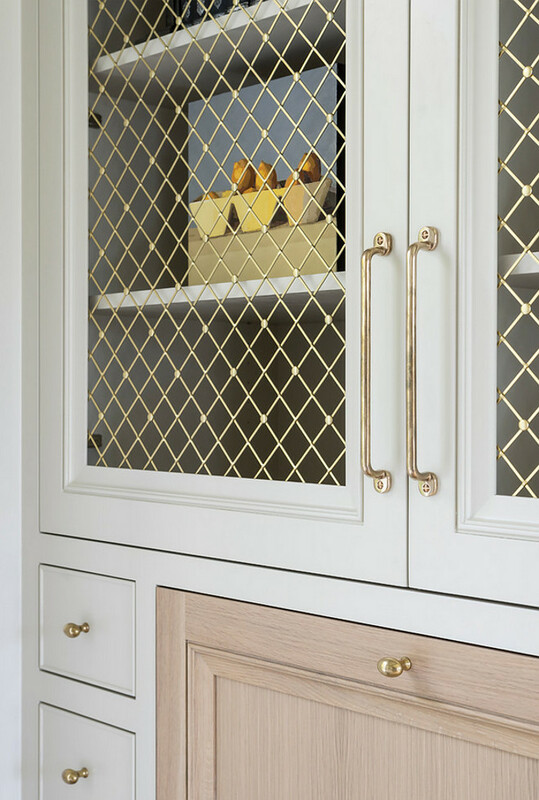 The study features cabinets with brass wire mesh doors and brass hardware. 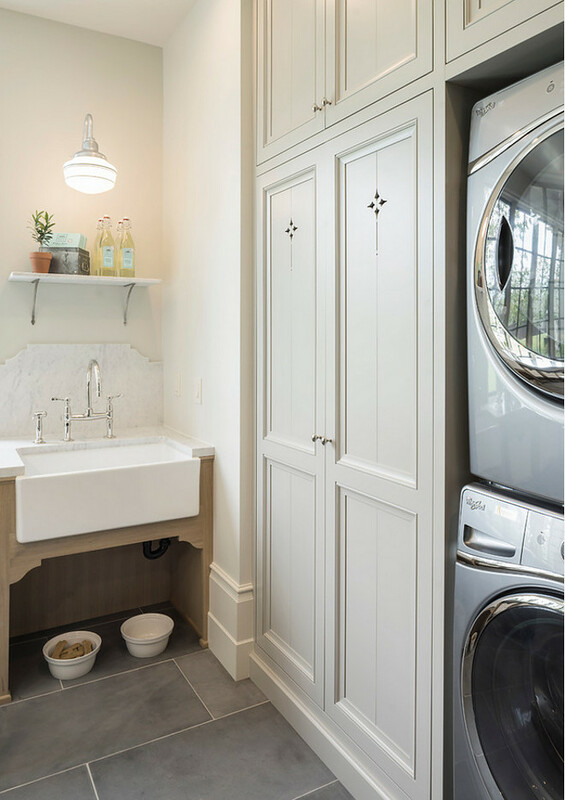 Both function and aesthetic were key in creating this laundry room that makes chores feel like a breeze. The laundry room features a useful farmhouse sink, pale gray cabinets and slate flooring. This powder room is full of personality! 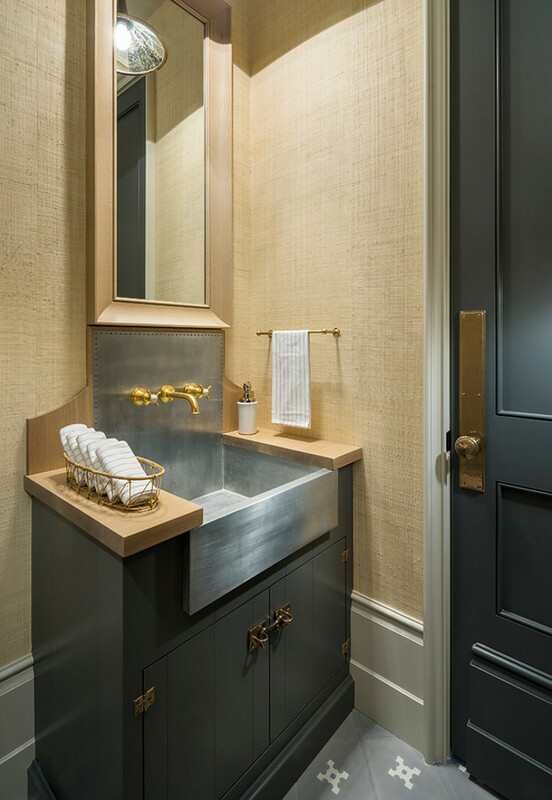 I love the textured wallpaper, the dark gray cabinet and door and the custom sink with brass wall-mounted faucet. Exposed painted brick is once again used to bring texture and interest of this home. The kids’ study comes with built-in desks, which is perfect for homework, and comfy sitting areas for reading. 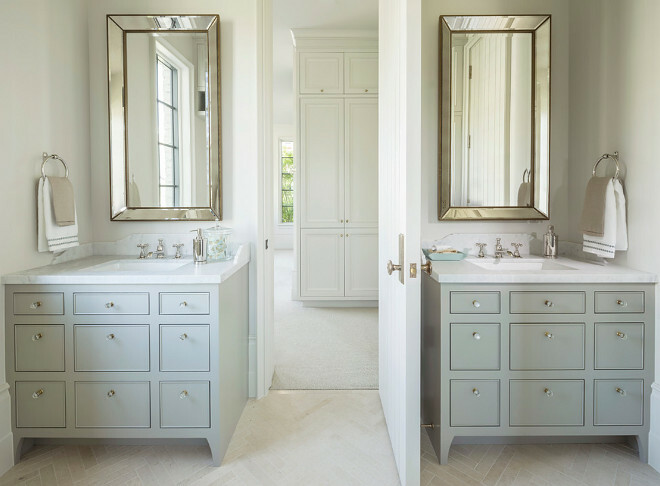 Soothing colors and textures make of this bathroom a calming place to be. Notice the herringbone floor tiles. Isn’t this master bedroom breathtaking?! I love the decor, the furniture, the lighting and flooring. This bedroom is not large but the furniture layout seems to work in this space. 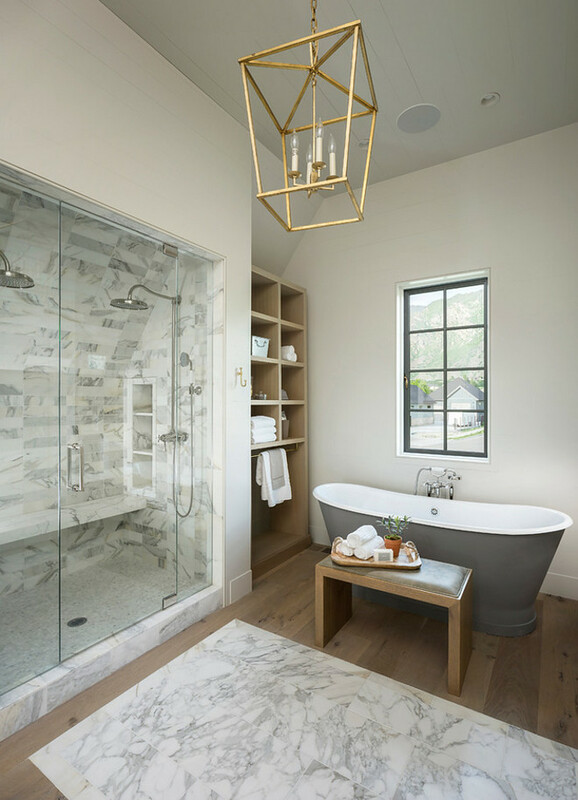 The neutral color palette makes this bathroom feel inviting and relaxing. 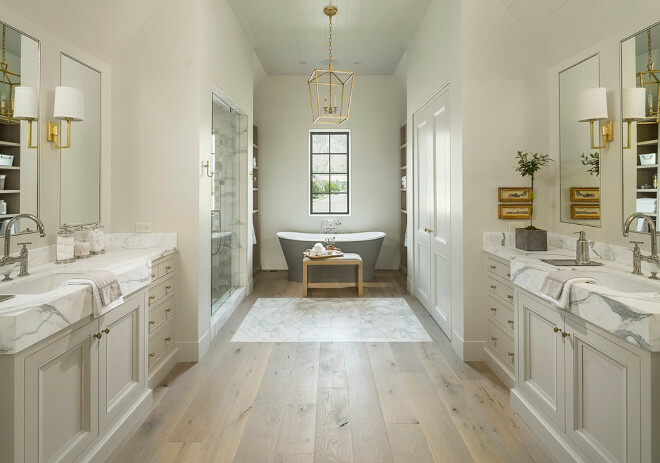 I love the mix of marble tiles and plank hardwood floors. It looks so chic and fresh. Pale gray cabinets look great with the marble shower and the ivory white walls. This home is beautiful from every angle. Notice the stunning mountains! 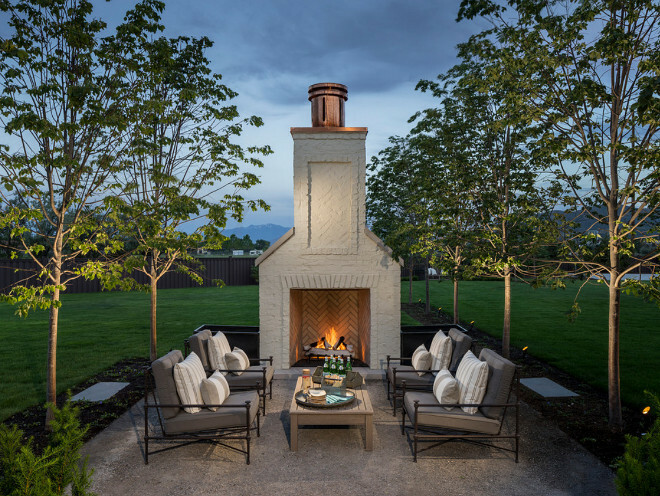 I am mesmerized by the glow from this welcoming outdoor fireplace, crowned with a hand-crafted copper chimney. From this angle you can see the fireplace area on the left, and the fenced-in vegetable garden on the right. 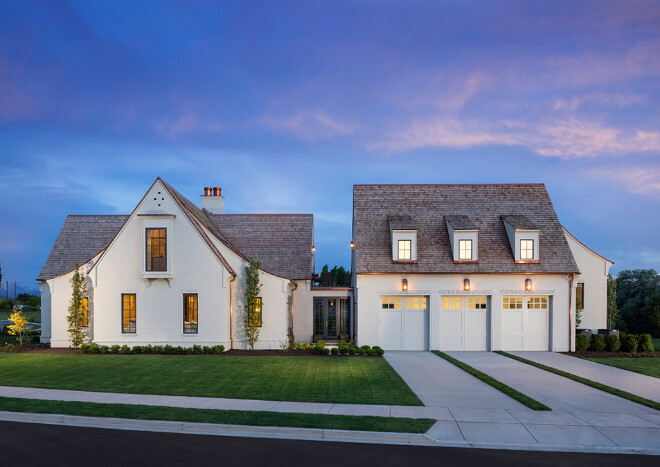 The home features a three-car garage with a bonus room above. 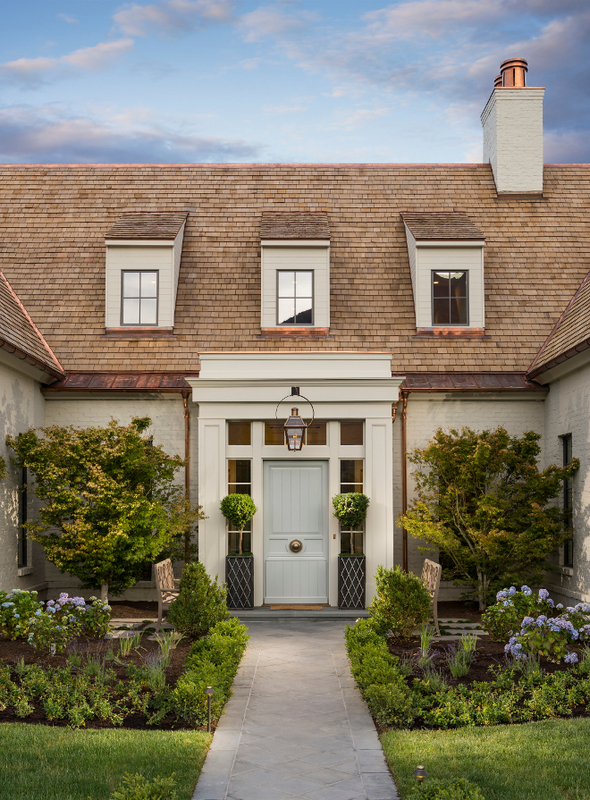 The exterior of the home was inspired by the designer’s recent trip to Europe. She felt inspired by the many English farmhouses she has seen abroad. Hi there! This is spectacular the details are incredible…love every single room! Beautiful home and setting. Would love to know the front door color! Unfortunately the builder is not being able to share any details… I would love to know the color as well. If I had to guess, I would say it’s similar to “Farrow and Ball Parma Grey”. As large as the house is, it’s surprising how small the master bedroom is. I think the master bath is bigger than the bedroom. I really like the house. I think the master bath looks HUGE & I was wondering what size it really is…if the builder can’t share, do you have any guesses?? We’re working on the plans for our new house & I’m kinda obsessed with room dimensions right now. Actually, I always appreciate knowing what size the room is that I’m drooling over…I can better see how it may (or may not!) relate to my reality. 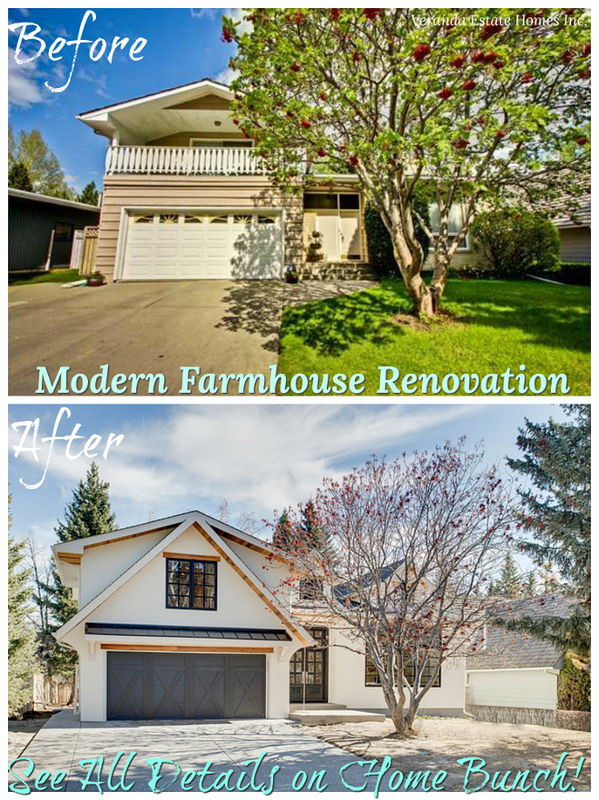 Thanks for sharing all the pics & stories of all these gorgeous homes! A really well thought out home and the finishes are beautiful. Thanks for the post. Wow! Thanks for sharing! Interesting geometry for sure and I love the little cabinet door detail in the laundry room. Love the designer. 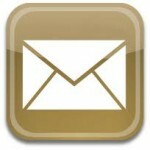 I am trying to find contact info for establish design. 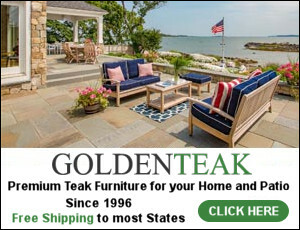 I can’t seem to navigate their website to find any contact info? I’d love to know who makes the kitchen brass hardware, the pulls and knobs. Love!!!! I don’t have this information. Please try to contact the designer personally. I shared everything I knew about this home. Wow so much to love here..gotta go back up and pin away!! Hope all is well with you and your summer is going beautifully!